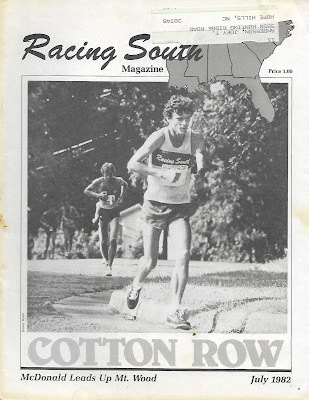 I have been following this race since the beginning of this 39th annual event in Huntsville Alabama and always hoped to run it some day ,but I was always finding it hard to spend the money to travel for just a 10k. But with my focus on shorter distances in the past couple of years and with it being the final race of the Running Journal Grand Prix, it was time to go for it. The race is one of the Premier 10k races in the country, not just the Southeast and has seen many world class competitors over it's history. 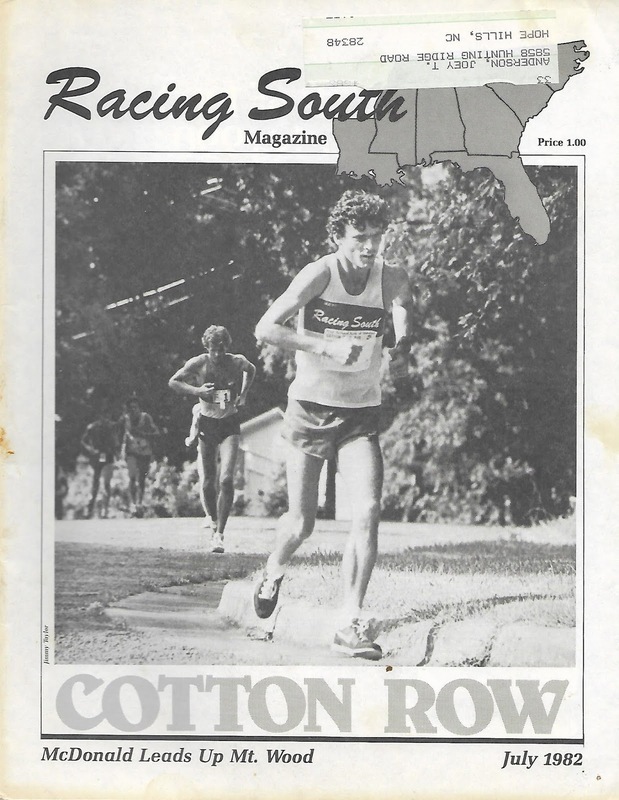 I had found while running the Rocket City Marathon that the great reputation of the Huntsville Track Club and community was well deserved and this race was proved to be a great one. Being on Memorial Day you can always expect warm and muggy conditions and this year was no exception with tropical moisture hovering over the State. 70F and 100% humidity guaranteed it would be a sweatfest but how well would I be able to handle the conditions? I did my usual warm up routine of a one mile easy run followed by 4 strides finishing up about 10 minutes before the start. I tried to get pretty close but then waited for the ceremony honoring the fallen heroes on this Memorial Day. I have to say its the first race I began with tears welling up inside after the invocation, 3 gun salute and the playing of taps. But finally it was time to go ! Despite starting near the front I still was being held up by some really slow people that always want to jam things up so I just patiently waited for ways to make my way around as things begin to spread out. By 1/4 mile it was not bad and I knew I could make up the time later, probably only losing 10 to 15 seconds. My fantasy goal pace was 7:30 but realistically 7:45 so when I passed mile one in 7:35 I was satisfied and feeling pretty good. Mile 2 had no major hills but mostly a slight incline and I felt my cadence and stride were ok so I was a bit disappointed with it taking 7:56. So much for fantasy goal but at least I was still feeling good. I knew what was coming soon so I was trying to go as hard as I could on the next mile without going into oxygen debt. Mile 3 continued with the mostly up but did have a little bit of downhill to help with that until we came to the turn onto Mountainwood Dr, aka Mt. Wood, the infamous hill I was warned about. Wow ! Talk about steep ! I thought the hill in Riverside Park at the VA 10 Miler was tough but this is much harder. For my friends familiar with North Turkey Creek in Umstead, yes it is even worse than the worst on that trail ! Immediately after making the turn the road rose sharply with the 3 mile mark maybe another 50 yards ahead. I passed that mark in 8:16 for a 3 mile split of 23:48 and then began walking with hands on thighs for support up this monster ! At this point I'm running in the top 300 of 1,800 and already practically everyone is having to walk ! 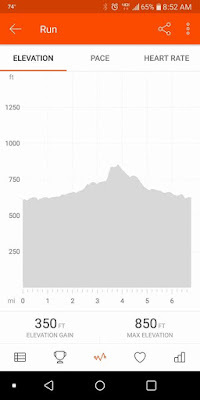 Disappointing that I had to walk but I was moving about as fast as the ones trying to run in most cases and when the grade finally eased off to just a normal bad hill I started back running. We made a turn and had a slight downhill before continuing to climb to the high point of the course at around 3.6 miles. I knew I had about 1.5 miles of sweet downhill ahead and after a minute I was recovered and began to push the pace. Even with the bit of downhill mile 4 was 8:52 thanks to that soul crusher of a climb but I was up to speed now, feeling ok and passing a lot of runners. I passed mile 5 in 7:32, not bad but with the huge gravity assist I was hoping for better. The goals were not going to be achieved and now I was just hoping to break 50 minutes and maybe, just maybe make the podium. 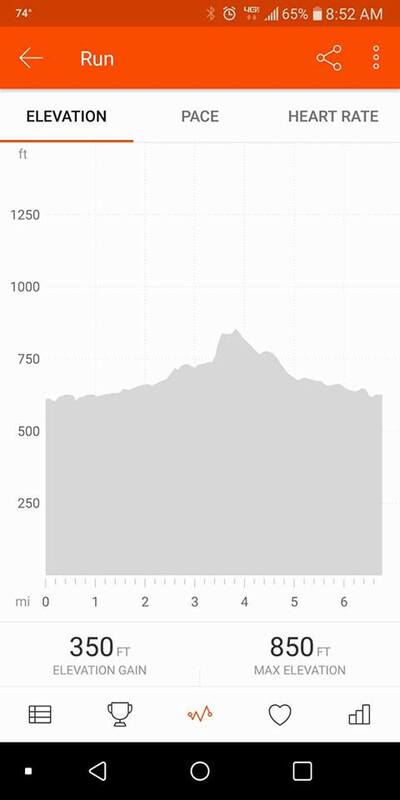 The last mile was mostly an ever so slight decline with a couple of small hills, the last one at about 5.8 mile mark just before the final turn onto the finishing stretch. I was giving it all I had but had still slowed to a 7:52 and even with a kick which I didn't have in me, sub 50 was gone. I pushed on until I made it across the line in 50:08. A volunteer handed me a water bottle which slipped out of my hand and I just bent over looking at it when a medical person walked over and asked me if I was alright . I assured her I was but I was too sweaty to hold onto the bottle ! She picked it up and opened it for me. Now I had to wait for the results to see how the competition had fared. After doing a cool down mile the results were posted and I had finished 4th out of 66 in my age group of 60-64 year olds. On top of that, three others in the 65-69 group had put in great performances dropping me to 7th in the Senior Grandmasters division so I made 20 points in the series. Although I didn't make any of my time goals or make the podium I am satisfied that I gave it everything I had out there on the course. I was making the death noises for pretty much the whole 2nd half of the race as I pushed myself to the max. As for the placement, I salute those hard working fellow seniors that had to run in the same miserable conditions as I did and earned those podium spots. Over an hour after the race I still had sweat dripping off my shorts ! This concludes my 9 month long journey through the Grand Prix Series. I'll be doing a wrap up soon so stay tuned.